Much of the sentiment data seems to indicate investors are a bit nervous about stock ownership. 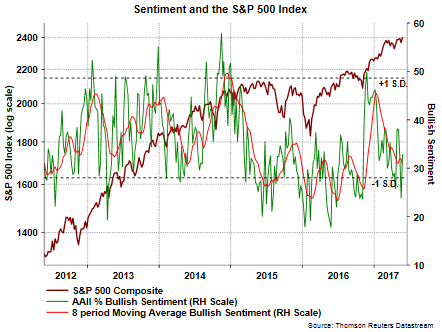 This morning's sentiment survey report by the American Association of Individual Investors did show a nine percentage point improvement in the weekly bullish sentiment reading, increasing to 32.9% from last week's 23.9% reading. However, the less volatile 8-period moving average of the bullishness reading remains at a low 31.1%, improving only .4% on the week. Now that the Wall Street Journal and others have declared it dead, it is interesting to consider what exactly the Trump trade was. As Josh Brown put it, the election provided finality, but the “Trump Trade” never really existed. A decisive victory either way could have been bullish for the markets. In our Q4 2016 investor letter, we said that the election conclusion was simply a catalyst for a much needed rotation. The catalyst was difficult to predict, but the eventual rotation seemed likely. So, now that it is dead, where does that leave us? The below chart shows the S&P 500 P/E and PEG as of 11/4/2016 (prior to the election). Pre-Trump Rally, defensive sectors like Consumer Staples, Utilities, and Telecommunications all looked relatively expensive based on PEG ratios while some (not all) cyclical sectors appeared relatively cheaper. 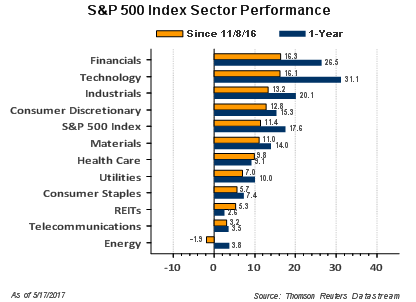 The post-election performance (yellow bar below) reflected a reversion to the mean for each of these sectors with the most expensive underperforming while the least expensive outperformed. So, where does that leave us today with the recent “death” of the Trump rally? Relative sector valuations look more similar. Utilities still appear moderately expensive, but Telecom has taken its place as the clear outlier (due to lower growth expectations). Everything else is hovering around a PEG of 1. We are back to “normal”. The election served as the catalyst for this rotation, but it may have come regardless of the ultimate victor. 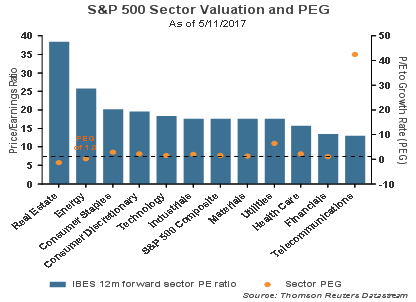 With earnings growth looking very strong for Q1, most sector valuations now appear reasonable. The slight bias towards defensive sectors (Utilities, Staples, and especially Telecom) makes sense given the widespread caution throughout much of the last few years of this bull market. 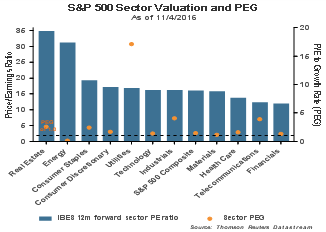 The overall market is not cheap, but if earnings come in as expected, only a few sectors look particularly expensive. 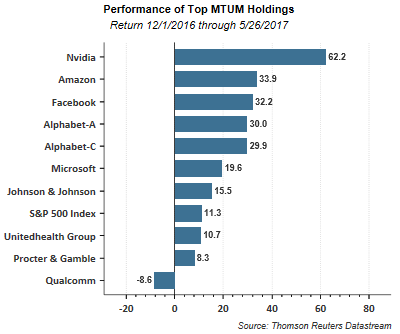 It is back to the future for the market as momentum is once again a leading investment strategy just as it was in 2015. 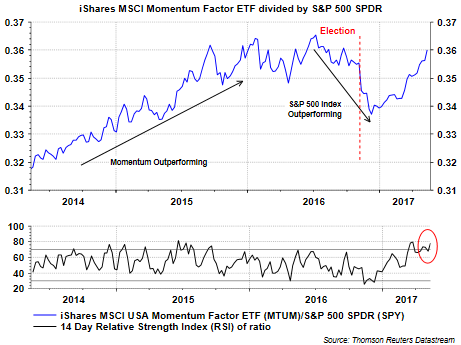 Momentum fell out of favor in the run up to the election and into year-end 2016; however, momentum is once again leading the S&P 500 Index this year. 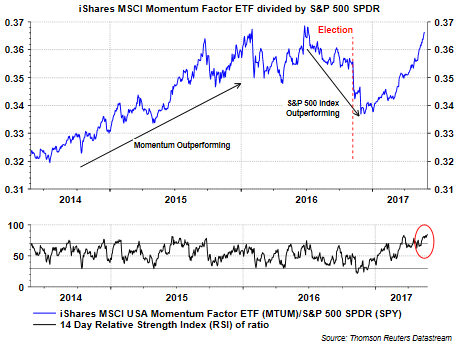 The momentum strategy may be overbought near term with the RSI near 80. It seems anything associated with brick and mortar retailing is an investment that will do anything but go up. The brick and mortar retailers themselves are struggling to figure out how to compete in the internet age. Macy's (M) reported disappointing earnings today and the stock closed down 17%. After the market close, Nordstrom (JWN) reported results with earnings up 37%, yet same store sales were down a worse than expected .8%. After hours Nordstrom's stock is trading down 3.5%. The green line in the below chart represents the FTSE NAREIT Equity Regional Mall Index (FN22). 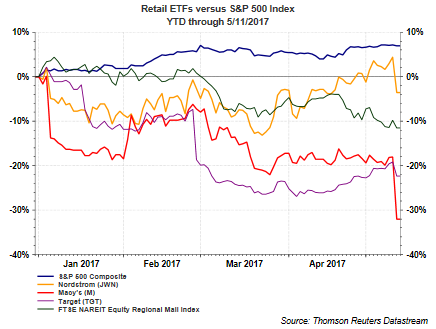 This index is struggling along with the brick and mortar retailers as well. 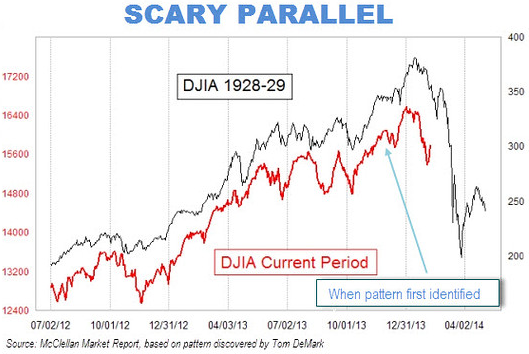 Indexing Investment Strategy Becoming Increasingly More Risky? Indexing ones investments has turned into the investment strategy of choice for a number of investors. According to a recent Wall Street Journal article, in 2016 82% of new investments coming through financial advisers (more than $400 billion) went into index funds and ETFs. This statistic was highlighted by Consuelo Mack on a recent WealthTrack segment where she interviewed David Winters of the Wintergreen Funds. Winters addresses several points about the potential risks and factors surrounding index funds, one risk called look through expenses and the other about index investing ignoring company fundamentals. I did not necessarily buy into the look through expense argument; however, the issue with indexing 'ignoring company fundamentals' is a very valid one. The WealthTrach video is provided at the end of the post. Almost to the day one month ago, when oil was trading at $52.25/bbl, I noted higher oil prices faced strong headwinds. I mentioned several factors that would likely result in lower oil prices, with the largest being the oversupply of oil in an environment where drilling activity was picking up. Fast forward to today and the price of spot WTI has fallen 12.8% to $45.55/bbl. 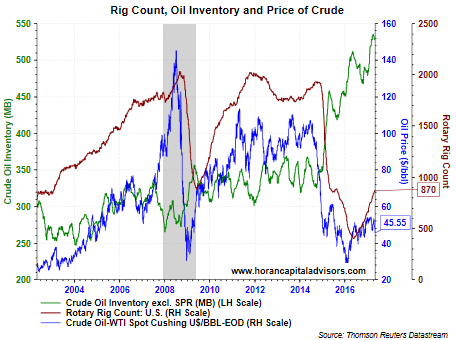 Additionally, supply does not seem to want to abate as the rig count has increased to 870 rigs this week versus 839 in the month ago article. A faster pace of supply growth continues to be the overriding issue although demand continues to increase as well, but yet to reach pre-recession levels. 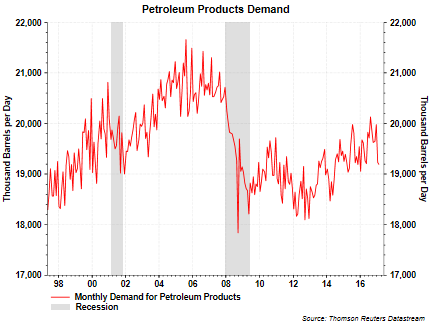 Certainly, the below trend rate of economic growth is playing some role in the lower overall demand for petroleum products. Another factor in the slowing rate of demand growth is energy efficiency improvements made to a number of petroleum consuming parts of the economy. One significant area of improvement is in the area of vehicle gas mileage. This is important as gasoline is the main petroleum product consumed in the U.S. and accounts for nearly 47% of petroleum consumption. As the first chart below shows, since 2014, consumers have consistently driven more miles, year over year. 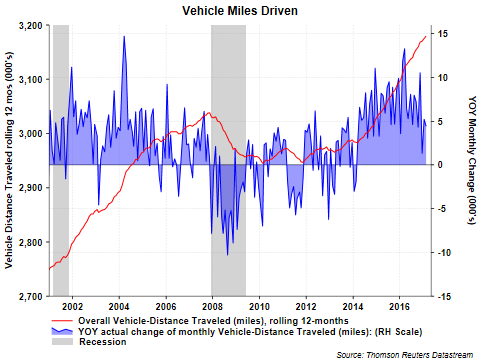 This has translated into continued growth in total vehicle miles driven on a rolling 12-month basis and finally surpassing the pre-recession peak in 2015. 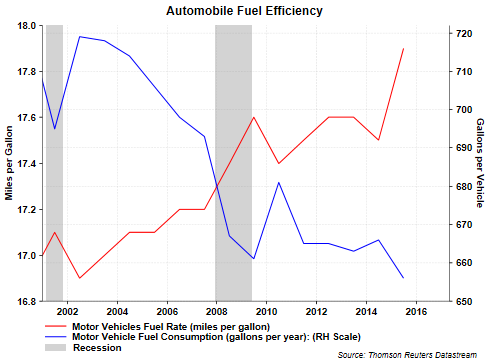 The efficiency is most evident in the below chart the shows miles per gallon for all vehicles (red line) along with gallons consumed per vehicle in a given year (blue line.) Improvement in both of these areas has slowed the growth in the demand for petroleum products. In conclusion, a below trend pace of economic growth and efficiency improvements have served as a headwind to higher oil prices, especially in an environment were drilling activity is increasing. The article from a month ago also discussed the potential oil price headwind resulting from a stronger U.S. Dollar, vis-à-vis, a potentially higher interest rates. This may become a more significant factor next month as the odds of a Fed interest rate hike in June are now around 75%.